Rediff.com » Movies » Cannes 2018: Why was Mallika in a cage? Cannes 2018: Why was Mallika in a cage? Mallika Sherawat will go to any extent to raise awareness about forced child prostitution and trafficking. 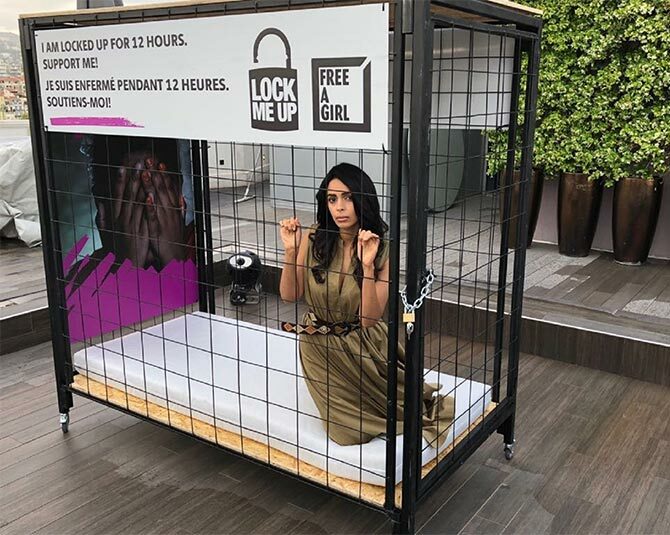 Mallika -- ambassador for the international NGO, Free A Girl India -- locked herself in a 12'x8' cage as a part of the Lock-Me-Up campaign at the Cannes film festival. It is her ninth year in Cannes and Mallika took the opportunity to draw global attention to the issue all of us should be concerned and doing something about. 'I am locked up in this cage. the size of the cage in 2 metres which is representative of a brothel in India where little girls are trapped and forced into child prostitution,' Mallika says in the video.